In the first 24 hours of his presidential campaign, Sen. Bernie Sanders (I-Vt.) raised more than $1.5 million from 35,000 donors, his campaign announced Friday. Since his formal entry into the race Thursday at noon, more than 100,000 people have signed on to his mailing list, the campaign said. That news was overshadowed by the revelation that Shelburne-based Vermont Teddy Bear Company has introduced a new ursine product in his honor: the Bernie Bear. The gray-suited, bespectacled bear, replete with "iconic, unruly hair," can be yours for just $79.99. "We just couldn't resist," Vermont Teddy Bear CEO Bill Shouldice said in a press release announcing the bear's birth. "Given Sen. Bernie Sanders' well-known affinity for President Theodore Roosevelt, and our products' tie to the former president of the United States, it seemed only natural." 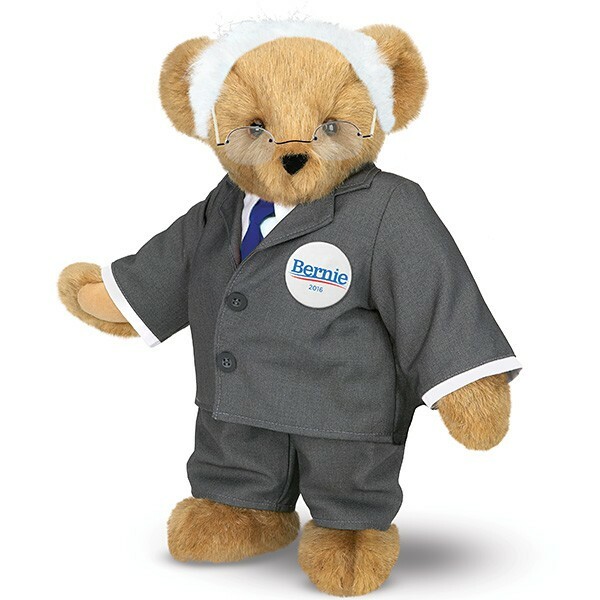 While the stuffed animal bears a passing resemblance to Sanders, it appears more cuddly and more kempt than the genuine article. And while the democratic socialist might object to the "yuge" profits the millionaires and billionaires behind the bear stand to make, he can rest assured that the product comes with "free universal Bear Care" at the company's "Teddy Bear Hospital." The Bernie Bear makes a perfect companion to the company's Fifty Shades of Grey bear. Then again, maybe not.